HOVER MOTOR COMPANY: 2013 Malibu Eco test drive and review. California, here we come! Of course, we’re talking about the Chevrolet Malibu, which is built at the General Motors Fairfax Assembly Plant in Kansas City, Kan. Fairfax is perennially the largest employer in the Kansas City-area, and the popular Malibu is built alongside the luxurious Buick Lacrosse. I was given the opportunity to drive a brand new 2013 Malibu Eco for a week, and I can tell you that the all-new ‘Bu handled the Kansas City commute quite commendably. Chevy points out that the new Malibu takes its styling cues from the muscular Camaro, and there are some things that remind you of the roided-up pony car. Most notably are the taillights, which are sort of rectangular-shaped like those on the Camaro. This practice of Malibu stop lights aping the Camaro isn’t unprecedented. The 1971-’73 Malibu adopted four round taillights just like the ’70-’73 Camaro. I didn’t really notice people staring at the new Malibu when I was out and about, but when asked, the people I know said they liked the looks of it. The handsome 2012 version was a hard act to follow, and I think it would have taken quite a bit to beat that for this update. But this car looks as good or better than most of the cars it competes with. You could say it has a European luxury vibe. Chris Bangle would be proud of the trunk lid treatment. The 2013 Malibu’s most impressive view is from the inside. This interior makes the guts of my ’96 Impala SS look like the inside of a Rubbermaid trash can. The attention to detail in the instrument panel and wraparound door panels is phenomenal. There is a lot going on here—basketball-like texturing on soft surfaces, chrome accents, a painted center stack bezel, fake tiger-striped wood—but somehow it all comes together in a coherent package. The cool blue lighting, especially in places like the accent panel in front of the passenger, gives the new Malibu a modern, almost nightclub-like atmosphere. I loaded the Malibu up with co-workers one afternoon, and we all headed off to Chic-Fil-A for lunch. I was worried that the three people in the backseat were going to complain about the tight quarters. But surprisingly, they all said they were comfortable, at least for the 20-minutes they had to spend back there. Everyone also seemed to be impressed with the dazzling dash, touch screen, and backup camera. I think the Malibu was a hit. Should I tell them that I had to give it back? The Malibu will eventually be available with a 2.5-liter four-cylinder engine and a 2.0-liter turbocharged four, but the initial vehicles like my tester are equipped with a 182-hp 2.4-liter four-cylinder paired with a 15-hp electric motor. This combination is the basis for the “Eco” moniker, and while it isn’t exactly a hybrid per se, it is stingy at the gas pump. Chevrolet calls this setup “eAssist.” The rear-mounted lithium-ion battery pack harnesses energy from the braking system when you bring the car to a stop, then the charged-up battery runs an electric motor that assists the gasoline engine when it’s time to go. Also, the engine shuts off completely when the car comes to a complete stop, and the accessories are run off of the battery pack until you take your foot off the brake. The Eco also receives low-resistance tires, lightweight aluminum bits like the hood, and even lighter carpeting and dashboard materials. A small, green "Eco" badge on the trunk, which my wife thought was an Enterprise Rental Car emblem at first glance, lets people know you're saving the environment. You might not even notice most these features, but they all work toward the goal of better fuel economy. 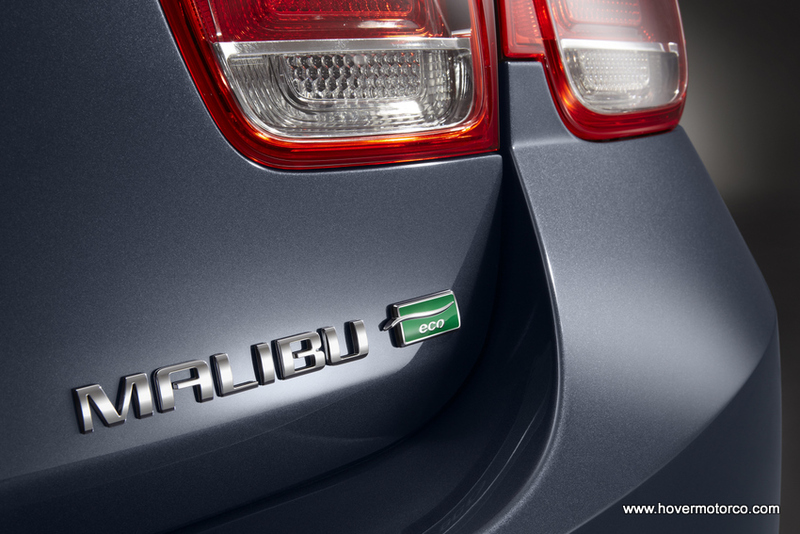 The EPA ratings for the new Malibu Eco are 25-mpg in the city, 37-mpg highway. Our test car observed a city/highway average of about 28-mpg according to the on-board computer, but that was with a week’s worth of relatively choppy stop-and-go daily commuting. The battery pack and electric motor is located in the trunk behind the seat. 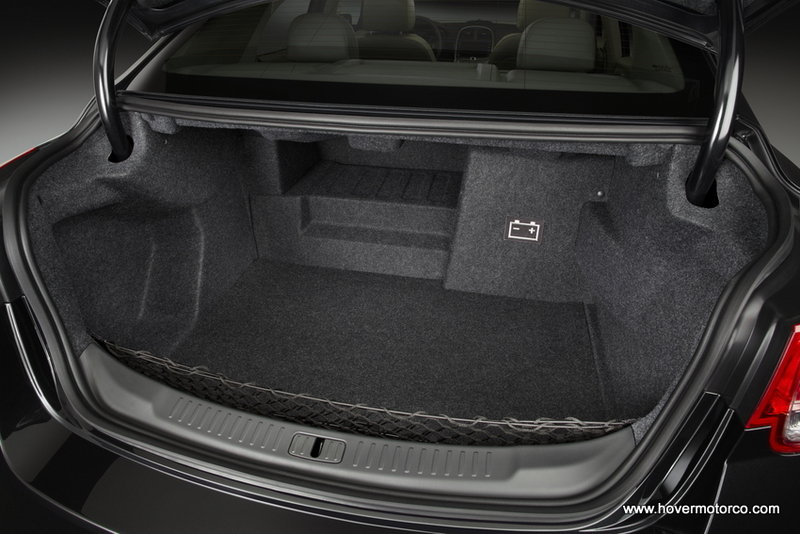 Trunk space is limited to 14.3-cubic-feet with this setup, and it severely limits the pass-through feature with the rear seat. Such is the price one pays for decreased fuel consumption. If you need the maximum trunk space, you’ll have to settle for a non-eAssist model later this summer. In contrast to its frugal intentions, the 2013 Malibu Eco is pretty rewarding to drive. From the seat of your pants it accelerates as if it has a six-cylinder engine, and it’ll easily cruise at 75-80-mph without subjecting you to frequent downshifts in the six-speed automatic transmission. Handling is modern and tight, and it manages to find a good balance between not feeling wallowy while still imparting confidence in the turns. Of course, I am still an old car guy at heart, so I wanted to get a little historical perspective. The original Chevelle/Malibu/Malibu SS arrived on the scene in 1964 as a competitor to the Ford Fairlane. And it so happens that Kansas City is home to a large enthusiast following of my test car’s classic cousins. Several members of the Mid-America Chevelle club were kind enough to meet with me and give their opinions on the latest incarnation of their beloved nameplate. Since we obviously couldn't meet near the ocean, I went with a different nautical theme and joined them near the fishing boats that were for sale at Cabella's. It was a beautiful day, and one of the few since I had the '13 Malibu that it wasn't raining. Five club members brought their cars out, and it was great to see them for the first time since last fall. Several of the members and their spouses climbed in and out of the new Malibu, punching buttons and adjusting the seat. Now I figured that since they were muscle car owners, they'd rag on the new car because it was a modern front-wheel-drive. It certainly was nothing like the vintage V8's they were driving. They were actually very complimentary, though. They were impressed with the quality and all of the gadgetry, and they were dazzled by the sparkle of the optional Black Granite Metallic paint. Most of them didn't really seem to know that it was a different model than the current Malibu, though, which can be attributed to the conservative nature of this new redesign. I really appreciated all these guys and their wives coming out specifically to see the new Malibu. They got to check out the latest Chevy, and I got to see some sweet Chevelles. Driving the 2013 Malibu Eco might not be the same thing as visiting Malibu Beach, but the experience is quiet, tranquil, and satisfying. And the great thing about a car like this is that making that 1,600-mile drive to California would be nearly as nice as actually getting there. Plus, you wouldn’t burn up a horrible amount of gasoline. I really was sad to give up the switch blade-like key. If you’re looking to replace your aging Camry or Accord, I would recommend at least giving the 2013 Malibu Eco a test drive. I think Chevy has a pretty good thing going here; people just need to know about it. For more information on the 2013 Chevrolet Malibu, visit Chevrolet’s web page at this link. For more information on the Mid-America Chevelle Club, visit their Facebook page. If you like classic Chevelles and Malibus, check out the coverage of the annual Mid-America Chevelle and El Camino Show, which was held at the Great Mall in Olathe last September. And for more information on the General Motors Fairfax Assembly Plant, the birthplace of my test car, check out this story. You just want pictures? I’ve got those too. Some of them are mine. Some of the better ones are courtesy of General Motors. There are also pictures of the cars that helped out from the Mid-America Chevelle Club. See them all in the slideshow below. Special thanks to Cale Hoover with his Marina Blue '67 Chevelle, Rocky Hill with his Regal Red '66 Chevelle SS, John Roudebush with his sparkling orange and black '67, Rick Byfield with his Ascot Blue '71 Chevelle, and Ed Smoot with his Light Spiral Gray Metallic '72 Chevelle SS for jazzing-up the pictures for this story. Nice wright up on the new n "old" Chevy Malibu's...It was the first time Ive ever been in one of the new ones and I was very impressed with it. I didn't even realize they had a new Malibu. I like that. "You could say it has a European luxury vibe". Yep, sure could - it's very much a Saab. The basic architecture is Saab 9.3 and the new interior is very much Saab 9.5-ish. Saab did a good majority of the engineering for this line [and comparable Opels and Vauxhall/Holdens] as well as the Cruze. And thats a good thing! blog (I also love the theme/design), I don't have time to read through it all at the minute but I have saved it and also added your RSS feeds, so when I have time I will be back to read a great deal more, Please do keep up the great work. "2013 Malibu Eco test drive and review. California, here we come!". I do have some questions for you if it's allright. Could it be only me or do some of these responses appear like they are coming from brain dead people? :-P And, if you are writing on additional places, I'd like to keep up with you. It's awesome to pay a visit this web page and reading the views of all friends regarding this article, while I am also keen of getting familiarity.